My February birding has been thwarted. Until today. Today the weather was perfect: the sky was blue, the temperature delightful. There was just a slight breeze and the birds were singing. It almost made up for missing out on my January Wollongong pelagic when I was hoping to see a White-necked Petrel. The trip was cancelled because of heavy seas. What's worse is that the February Wollongong pelagic saw not one, but two White-necked Petrels! I had booked to do a pelagic out of Port Fairy in February, but that too was cancelled. This time, because they couldn't fill the boat. Very odd, when most pelagics have waiting lists. I did not expect to see a White-necked Petrel out of Port Fairy. Any seabird would have been welcome. And I would have seen Black-faced Cormorants in the harbour, and Hooded Plovers and Sanderlings on Killarney Beach. And we would have stopped at Point Addis on the way down to Port Fairy to tick Rufous Bristlebirds. I was feeling quite cheated. Then this morning I visited Wilson Reserve in Ivanhoe, and enjoyed myself immensely. The Powerful Owl looked at me wisely, and a Nankeen Night-Heron ignored me completely. Of course I always see Brown Thornbills, Grey Fantails, Eastern Yellow Robins, White-browed Scrubwrens and Superb Fairy-wrens. I would be surprised to miss out on any of these. 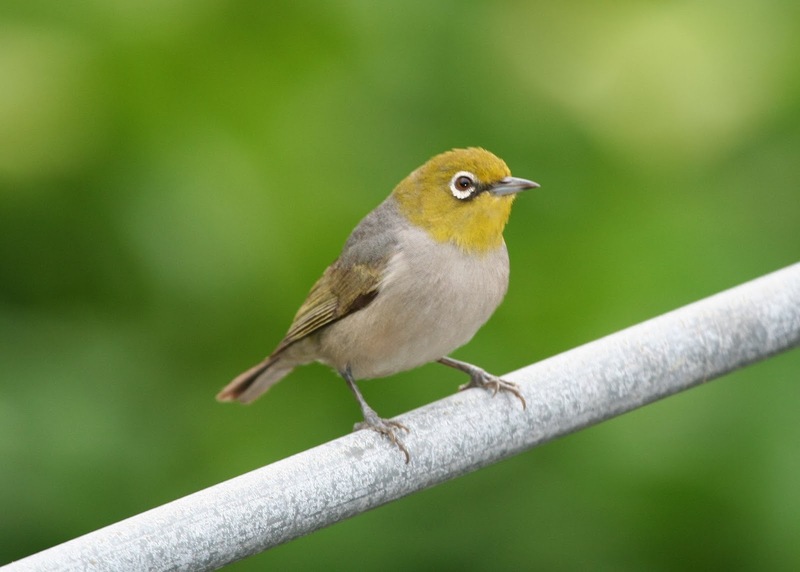 And, one of my favourite little birds is always there too: Silvereyes. The first piece of writing about birds I ever published was about Silvereyes. I was ten years old. They have been one of my favourites ever since. There are always Common Bronzewings here too. And of course, Grey Butcherbirds and Red Wattlebirds. I hoped to see an Azure Kingfisher which had been reported from here recently, but I missed out on that. I was wandering along the path, looking in the river for the kingfisher, when I heard a strange, grating call. What could it be? I looked in the gum tree above, but could see nothing. I looked again, then scanned the whole huge tree with my binoculars. There it was at last: a grey fluffy lump. Was it a baby frogmouth? It was still making its strange call. Then I saw its tail, properly feathered. It was a kookaburra. There was no sign of its parents, but no doubt they were within hearing, and recognized that strange call. The Bell Miners tinkled at me and a Grey Shrike-thrush sang delightfully. A Black-faced Cuckoo-shrike shuffled its wings, while I admired some dabbling ducks. I won't go as far as to say that this morning's enjoyable walk made up for the absence of White-necked Petrels in January, but I will say it was a very pleasant hour I spent with the birds.